Security and Policing 2019 > 2019 Exhibitors > Communications, Command & Control, Surveillance, Incident & Emergency Response > Paradigm Communication Systems Ltd.
Paradigm makes rugged and robust satellite communications solutions that are easy to handle and simple to use. Our new MANTA terminal supports both vehicle and ground setup straight out of the box. Just add power for quick and simple comms-on-the-go satcoms, Wi-Fi and 3G/4G/5G mobile networks. 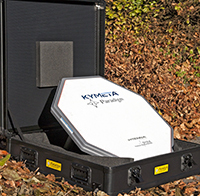 Our ultra-portable “internet in a backpack” SWARM terminal combines high speed satellite communications with low size, weight and power for rapid deployment. Choose either solution for on the go, anywhere, anytime simple to use emergency communications. Our products are standardised on by military, government and large NGOs across the world, proving the value of Paradigm’s simplified satcom. The versatile MANTA is a single case, self-pointing satellite terminal. A Ku-Band, high throughput complete solution designed for both static and mobile satellite communications. It is portable, discreet and operational in minutes. No pointing is required and there are no moving parts…just add power. Combining the latest flat panel self-pointing technology with the PIM® (Paradigm Interface Module), the MANTA fully integrates RF and all of the major modem types. The system utilises software to form beams and track the satellite providing rapid connectivity with no moving parts. The handheld remote offers additional live beam heading indication, satellite selection, transmit mute and system status information. The MANTA operates quickly and accurately without the need for tools in a tactical, static environment but can also be attached to a vehicle’s roof bars in minutes for satcoms-on-the-go mobile operation. It is lightweight for easy transportation and vehicle mounting with a low profile and streamlined design. Additionally, it is robust and weatherproof for operation in extreme and demanding environments. With its fast and versatile operation the MANTA is ideally suited to provide mobile communication services for the military, NGO, and emergency responder sectors.